Finally, after a journey lasting up to 13 days, and having taken men further from Earth than they would go for at least another two generations, Apollo's mission to the Moon ended with a hefty thump on the surface of the ocean. With luck, the spacecraft would catch the tip of the descending swell, softening its impact. Not so for the crew of Apollo 12. 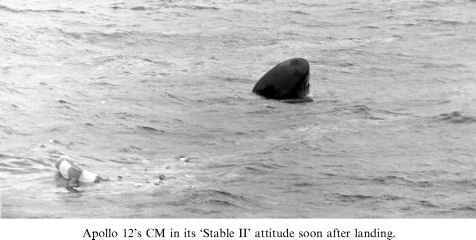 Luck went against them, and especially against the skull of LMP Al Bean when rough waves and bad timing created a very hard impact, as Conrad explained afterwards. 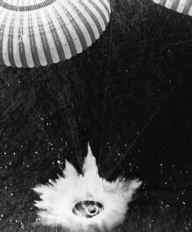 The moment of Apollo 15's splashdown. pyrotechnic circuits, so that when Conrad threw a switch, the breakers would cut the main parachutes free from the spacecraft. 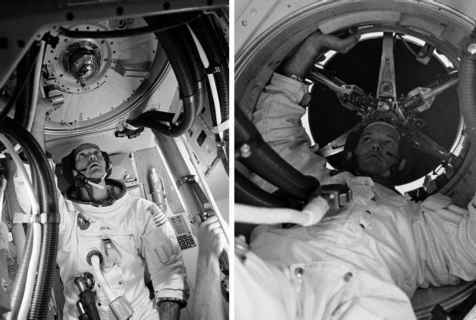 However, as Bean had been temporarily knocked unconscious by the dislodged camera, the cutters were not fired and the capsule was pulled over. Apollo 8's CM also ended upside-down. When it hit in the dark, Borman got drenched with a few litres of sea water. ''The one item that we were perhaps not expecting was the impact at touchdown,'' he explained afterwards. ''There was a severe jolt and we got water in through the cabin repress valves even though they were closed. A good deal of water came in the cabin pressure relief valve.'' Distracted by the torrent of water that had entered the cabin, he did not release the chutes before they pulled the spacecraft over. With the parachutes cut free, the SECS pyro system was safed for the last time. Beneath where the parachutes were packed, three float bags had been installed which the crew inflated with stored gas to upright an inverted spacecraft. Even if the spacecraft was floating upright, the bags were inflated in case a freak wave flipped it over.